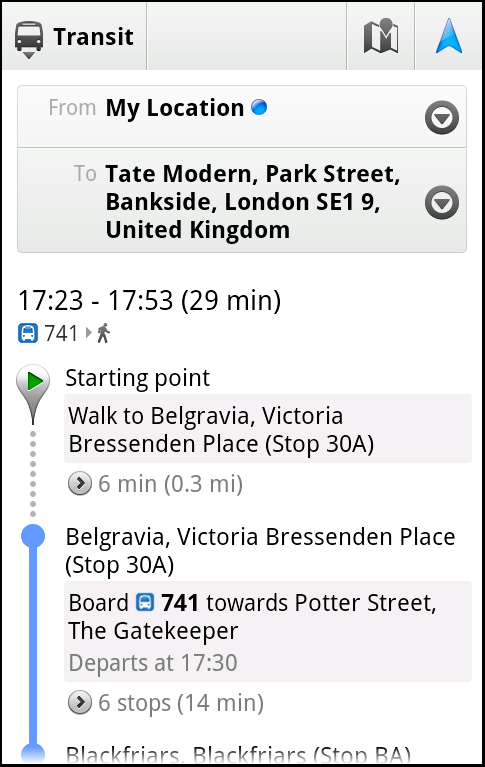 Today, Google Maps added public transport directions for London within Google Maps, including Google Maps for mobile on iOS, Blackberry, and Android-powered devices. 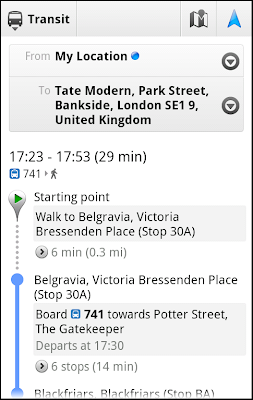 Now, whether you live in London or are just visiting, you can get public transport directions on your mobile device. Google Maps for mobile uses your current location to determine the best trip to your destination. Just search for your destination location, select it on the map and choose the “Directions” option. The suggested trips will be based on your location by default, and provide you multiple alternatives whenever possible. If you’re using an Android-powered device, you can also get public transport directions with Transit Navigation (Beta) in Google Maps. With this feature, you’ll get alerts when it’s time to get off the bus or train at your destination or to make a transfer. We hope that public transport directions in London make getting around town more convenient! About time! Such a cool update and it'll hopefully help out the many tourists we get in London! Wish we could get the same thing in Manchester, UK. Pretty complex transport network here as well. Very nice, although it doesn't seem to know that the Northern line doesn't stop at Tottenham Court Road at the moment!